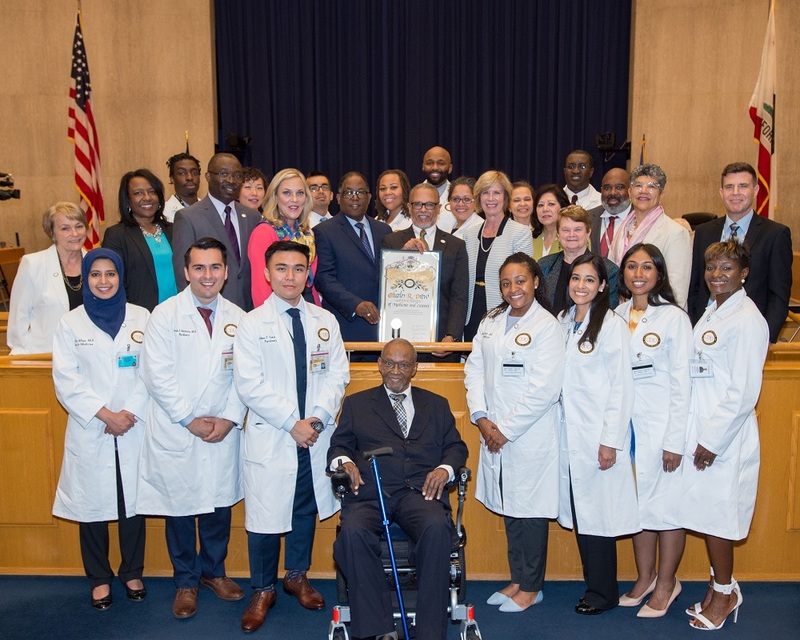 The Board of Supervisors celebrated the newly accredited Family Medicine and Psychiatry Residency Programs at Charles R. Drew University of Medicine and Science (CDU). 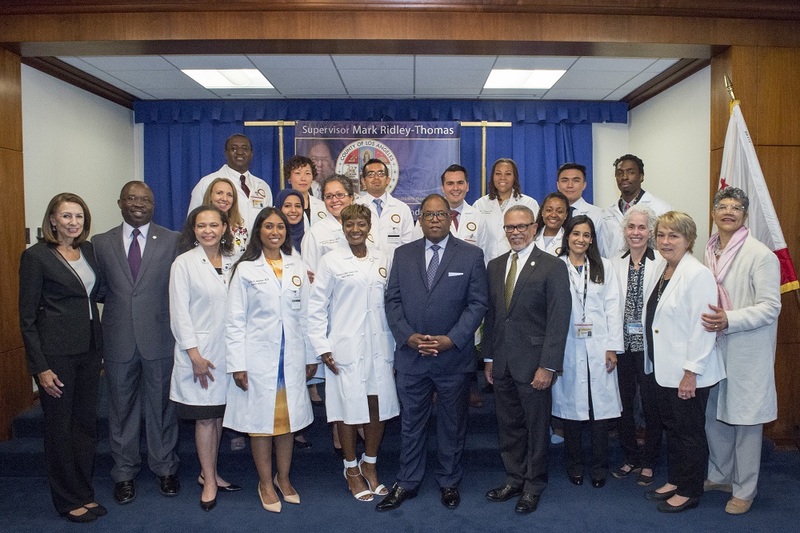 In partnership with the Los Angeles County Health Agency, the residency programs will train a new generation of doctors to serve patients in South Los Angeles and surrounding communities. Eight of the new Family Medicine residents and six of the new Psychiatry residents were on hand for the scroll presentation at the Hall of Administration. “We have a dramatic shortage of primary care and mental health clinicians in this nation, and this shortage is most acutely felt in communities such as South Los Angeles,” said Supervisor Mark Ridley-Thomas, lead author of a motion that helped establish the residency programs. “It is vital that we empower doctors-in-training to become medical leaders who promote wellness and healthcare equity in a compassionate manner. “This residency program will create a new pipeline for our homegrown LA County physicians,” added Supervisor Janice Hahn, the motion’s coauthor. CDU President and CEO Dr. David Carlisle said the residency programs are intended to benefit medically underserved communities in South LA. “If you want doctors to work in the community, you need to train them in the community,” he said. The Family Medicine residents will rotate through Department of Health Services facilities in the southern region of the County, including the Rancho Los Amigos National Rehabilitation Center, which will be their home base for inpatient rotations. The Psychiatry residents will focus on ambulatory services in communities that comprise the County’s Service Planning Area 6, which includes Athens, Compton, Crenshaw, Florence, Hyde Park, Lynwood, Paramount and Watts. Their primary training site will be the Kedren Community Health Center in South LA.